This month we will look at the parameters of cleaning products to successfully clean area rugs – the fifth and last in the series Rug Cleaning 101. We have discussed why attending a rug-cleaning training course is important (education is inexpensive, while rugs are expensive); how our new industry standard states rugs should be cleaned off-site (the S100 Standard and Reference Guide for Professional Cleaning of Textile Floor Coverings is out now); the importance of a rug pre-cleaning inspection; and state-of-the-art rug cleaning equipment that is now on the market. Wool is a protein fiber taken from the fleece of sheep, and can be identified with a simple burn test. The fiber will smell like burning hair. The key cleaning concern with wool is dye bleeding. Some information in the past lead people to believe cleaning with a high-pH solution would remove the protective scales or cuticle from wool, leaving a “shiny” rug or carpet. Giving a “luster wash” to improve rug sheen is done with caustic soda, not everyday traffic lane cleaner. 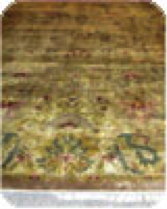 Do a colorfastness test as part of your pre-cleaning inspection of the rug. If you find it is a bleeder, an option is to re-test using a low-moisture method to see if that method will not cause dye bleeding. One cause of dye bleeding in wool rugs is the destabilization of the dye-fiber bond, caused by an alteration of the fiber pH. This change in pH is not caused by an alkaline solution alone. Yes, we should use products that are not too alkaline, but we should also be aware of buffering agents that can be found in certain cleaning products. Buffers are additives that stabilize the pH of a detergent after mixing, allowing for higher dilution ratios of concentrated products. The pH of a product is only a general guideline. The stability of the pH – how well buffered it is – is the most important factor in having a safe cleaning product. Large amounts of buffering agents (alkaline builders) in a cleaning product can cause a pH shift in a wool rug or carpet. This can happen immediately or over time, resulting in dye bleed. Just noting a cleaning product’s pH will not indicate if it has been highly buffered. In order to determine the stability of a product’s pH, a test called titration can be carried out on the chemical. It is impractical for a cleaner to perform such a test. An organization based in the UK called WoolSafe tests products for manufacturers, and if the product passes, they are allowed to use the WoolSafe logo (Image 2). This signifies that a third party has looked at your cleaning, spotting, protector and deodorizing products and found them to be safe on wool. In addition to using safe cleaning products for natural fibers, fewer dye-bleed problems will occur if you use room-temperature water. Using cool water will slow down the cleaning process a little, but you can make up for this with increased agitation, dwell time or cleaning product. 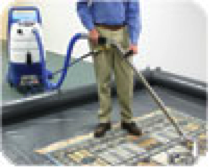 In addition, if you are using a truckmount or high-pressure portable (Image 3) to clean the rug, turn down the pressure. High pressure can cause pile distortion, so a setting around 200 psi is enough for natural fibers. If you follow the basics: use safe cleaning products; do a colorfastness test; perform a pre-cleaning inspection; use cool water; watch the pressure of your extraction equipment, your results should be successful without causing damage to the rug.